As I sat in the waiting room of my doctor’s office, I noticed a stack of free recipe booklets called ‘Wishing You Happy Holidays in Good Health’. I helped myself to a copy. Because the holiday season is a time notorious for weight gain (believe me, I know what I’m talking about! ), it was great to find some recipes that not only sound good, but provide taste and good nutrition - without the guilt. 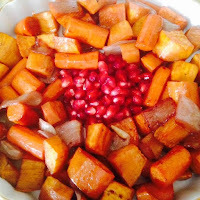 Since I had the necessary ingredients on hand, I tweaked their recipe for ‘Glazed Root Vegetables with Pomegranates’ to serve with dinner. I slightly changed the name, added some onion, and recalculated the glaze ingredients. NOTE: If you want to add another dimension of flavor to this recipe, you may add 1 to 2 Tbsp. of pomegranate molasses in place of the pomegranate juice in the glaze mixture. Coat a roasting pan with cooking spray. 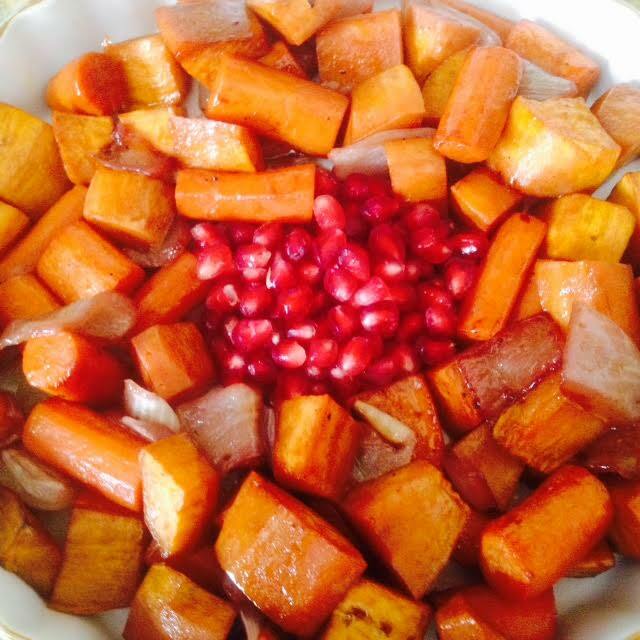 In a large bowl, whisk together the olive oil, pomegranate juice, salt and pepper. Add the sweet potatoes, carrots, and onions; toss to coat. 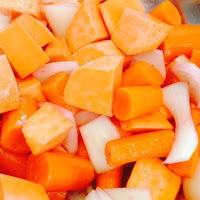 Spread the vegetables onto the prepared roasting pan in a single layer; roast for about 35 to 40 minutes, stirring once or twice, or until softened and golden brown. Before serving, garnish with pomegranate seeds or chopped parsley, if desired.